One of the most often asked questions about HK firearms comes shortly after the proud new owner brings his prized new HK home, and starts looking closely at the gun. There are a number of unfamiliar symbols on the guns that I will explain here. In the above example, the Chantilly import P7M8 has a serial number of 86912. Simple enough. What about the other symbols? What is the funny character with the 'N' under it? What does 'IE' mean? What is the symbol next to the 'IE'? The character with the 'N' under it is an eagle with spread wings. This is called the 'Bundesadler' and roughly translated means 'federal eagle." It is used on many German federal insignia. The 'N' stands for "Nitrozellulose" (Neetro-tselluloze) or "Nitrocellulose" in English. This is a universal symbol found on German firearms that use modern nitrocellulose based propellants. The 'IE' is the date code. More on that in a minute. The BWB is from the German "Bundesamt für Wehrtechnik und Beschaffung" or "Federal Bureau of Military Technical Procurement." The letter corresponds to the number. 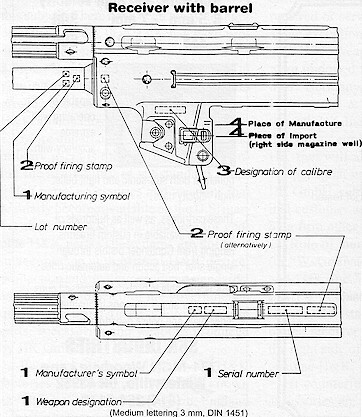 The letter 'J' is skipped for proofed firearms, but is present on magazines. 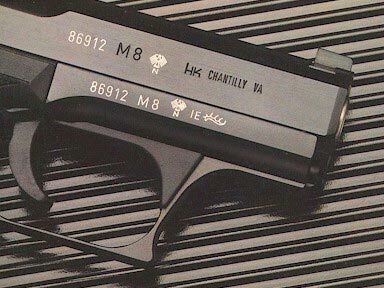 Therefore, the P7 above was manufactured in "84" or 1984. AUSFÜHRUNG WHAT? The various and confusing roller locked "Versions." The SD series goes SD4 buttcap only with burst group, to SD6 retractable stock with burst group. The 'A' is not used when describing the SD versions. There are exceptions that only familiarity with the weapon system distinguishes. For example, you might say HK33KA3, but not HK33KA5, even though it would be correct. This is primarily because the HK33 was never available with a burst group option until a few years ago, and the gun is now discontinued. The main departure from this nomenclature is on the G3. See the G3 page for more detail there. Another departure is the MP5KA1, which has no traditional sights. With a burst group, it is called the MP5KA4. Go figure. There are other symbols on the receivers, barrels, bolt carriers and magazines that are confusing as well. The best information that I have found on these areas is indicated by the diagrams below. 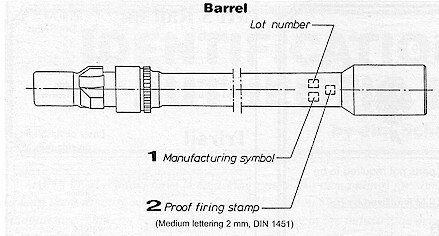 Location and layout for markings on MP5 barrels manufactured by HK. 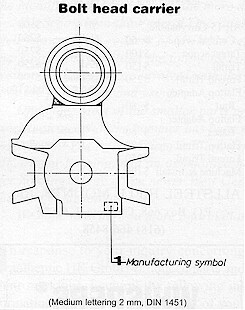 Location for manufacturing symbol on MP5 bolt carrier. Diagram for locations of symbols on MP5 receivers.